Yesterday was #Giving Tuesday/#ILGive and my email, Twitter and Facebook pages feed were filled with photos of youth and volunteers and requests for support. I hope every program that participated met or exceeded their goals, although I doubt this was true for most of the smaller organizations. 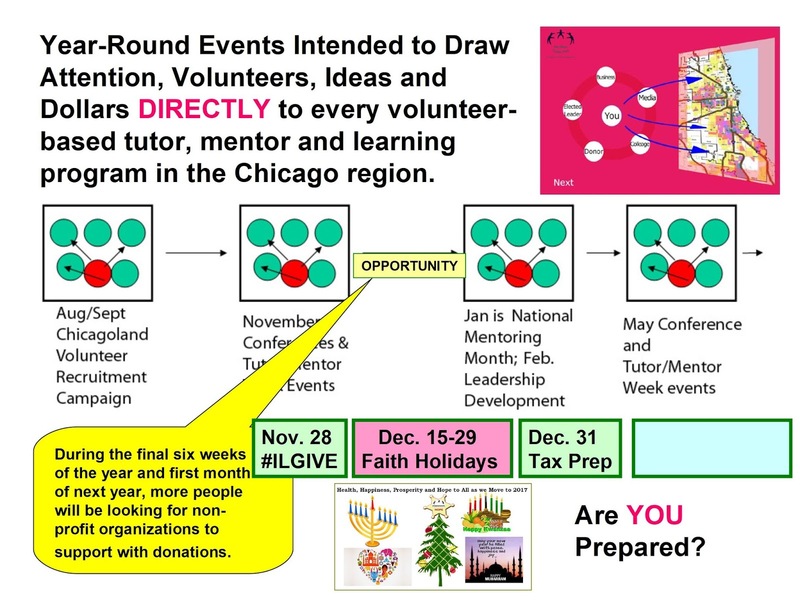 I wrote this article last November asking if "All Chicago Tutor/Mentor Orgs Filled their Funding Tanks on #Giving Tuesday". The message is still relevant a year later. 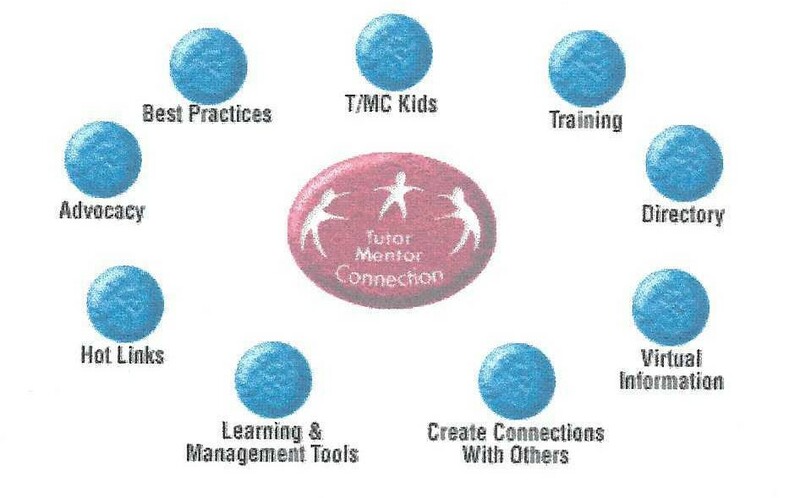 I created the Tutor/Mentor Connection (T/MC) in Chicago in 1993 to connect people who can help (almost anyone) with youth tutor and mentor organizations operating in different sections of the Chicago region. At this link you can find my list of programs and see how I've been plotting this information on maps. While it's great that events like #GivingTuesday attempt to attract donor attention, we need donor attention so every Tuesday of the year is a day when volunteers and donors look at map-directories like mine and decide who they want to help, how, and how much. In 1993 as we developed the T/MC we created a 10-point plan, which within a couple years was narrowed down to a 4-part strategy (described here). 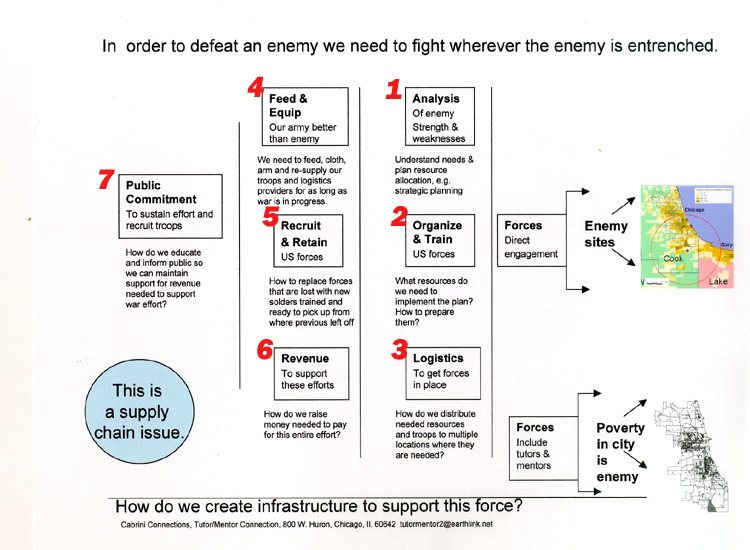 The cMap at the left shows the four parts of the strategy, but adds notes showing work that needs to be done and help needed to make each part of the strategy have the impact on Chicago neighborhoods, youth, and youth serving organizations, that it needs to have. 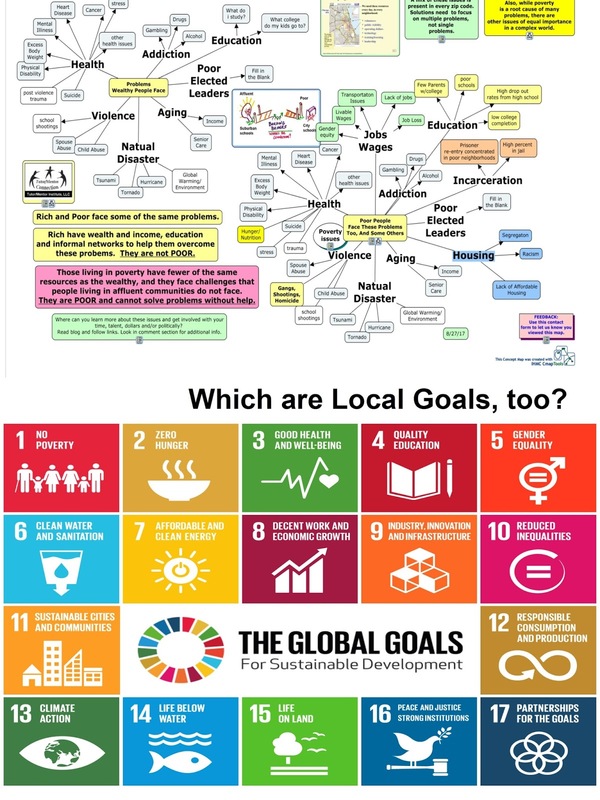 Anyone can look at a map showing poverty and other indicators of need and begin to ask what he/she can do to help fill each of those neighborhoods with a full range of needed programs and services, and what needs to be done to supply talent, dollars, technology and ideas to each program on an on-going basis. I hope some of my blog articles and Tweets encourage you to do that. If you're reading this, you can rewrite it and pass it on to people you know. You can create a video to show what I'm talking about. You can bring together a group at your faith group, business or school to ask "what can WE do to help great youth serving programs grow in all parts of Chicago?" As you do this I hope a few will reach out to me and ask "How can we help you?" instead of starting a new organization aimed at the same problems, but perhaps without the same strategies in mind. I look forward to hearing from you. Reach me on any of these social media platforms or email tutormentor2 at earthlink dot net. If you can provide year-end financial support to help me continue this work in 2018, click this link to find a PayPal button to use. 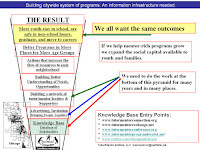 I've used this hub/spoke graphic for more than 20 years to describe my efforts to connect people and ideas in an on-going effort to build greater support for non-school tutor, mentor and learning programs that reach kids in high poverty neighborhoods of Chicago and other cities, and help those kids move through school and into adult lives. Hub represents an information source, a meeting place, an on-line community, etc. and the spokes represent the range of different people who need to be using this information, or who need to be helping kids in different places. Below is another example of this graphic. 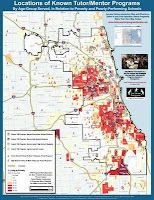 In this graphic I include a map of Chicago, with high poverty areas highlighted. The hub of the wheel includes an image of a youth and volunteer and a time line that stretches from pre-school on the left and work/career on the right. It shows the traditional public school as one source of support, and the family and community as another. The spokes represent all of the people and influences that are present in the lives of most kids, but are missing for many kids living in high poverty. 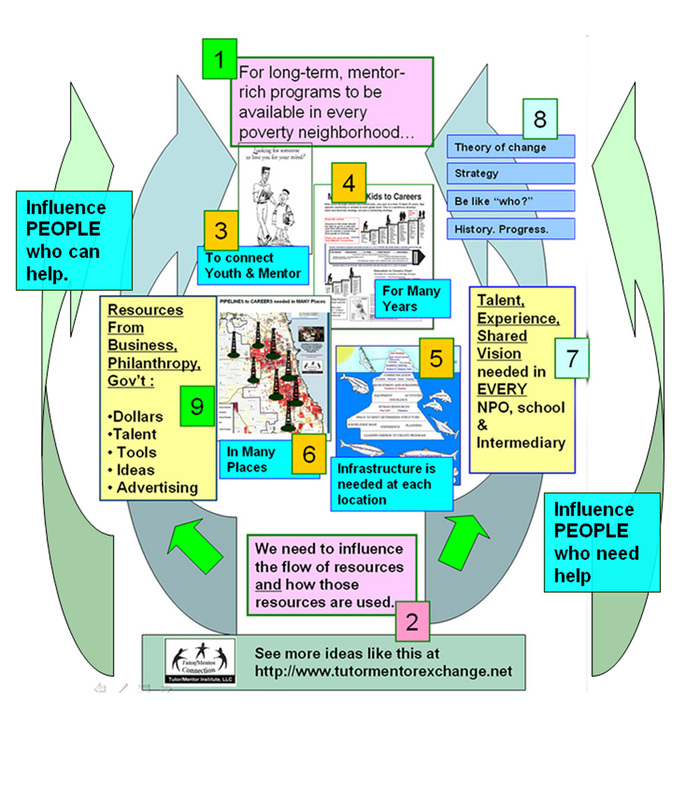 I created this Total Quality Mentoring PDF to illustrate how companies in different industries, represented by the spokes, could be leading on-going efforts to help tutor/mentor programs in many locations have activities that help kids learn what these industries focus on (arts, health, engineering, technology, law, etc). 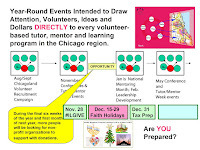 In this example I'm showing that volunteers who become involved in different tutor/mentor programs can be reaching back on a regular basis and encouraging other people in their network to get informed about where and why these programs are needed, and ways they can use their own time, talent and dollars to help great programs grow in all poverty areas of a city. The circles from the bottom of the hub represent on-going learning and discussions taking place in businesses, faith groups, media, universities, hospitals, etc. 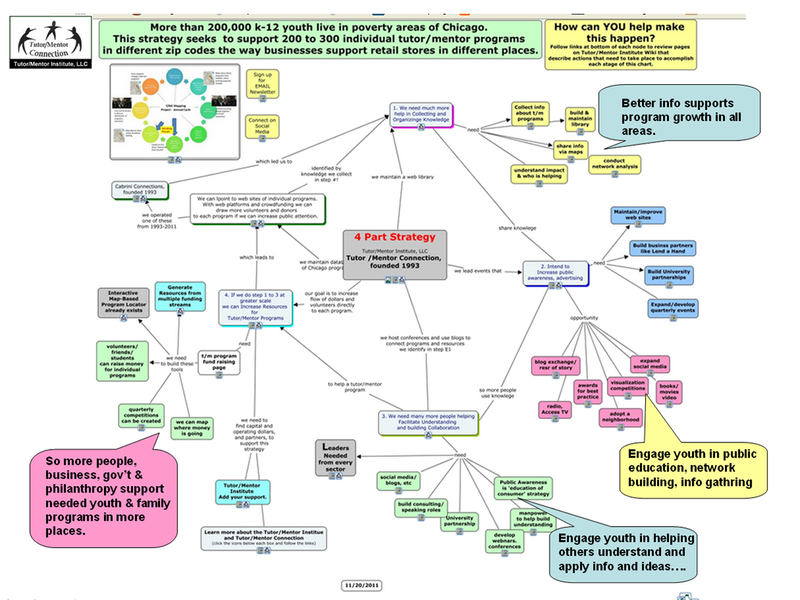 where people are talking about how to use the ideas to help youth tutor/mentor programs grow. 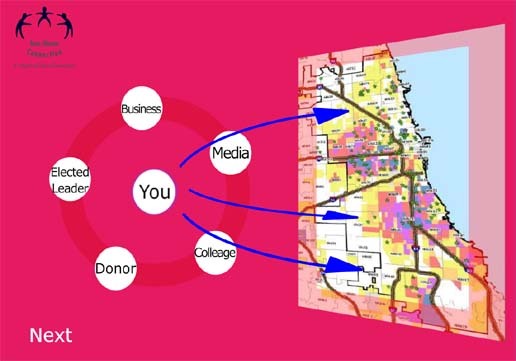 Last week I posted an article showing how I organized networking conferences in Chicago every six months from May 1994 through May 2015, in an effort to bring people together to learn and share and to build greater visibility for all of the programs operating in Chicago. I hope you will look at the conference goals. I've used this hub/spoke concept in dozens of graphics. 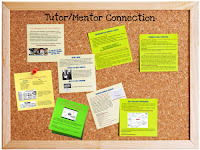 If you do a Google search for "Tutor/Mentor Connection Network Building", then look at the images, you can see many of these, and also visit the articles where the graphic was used. 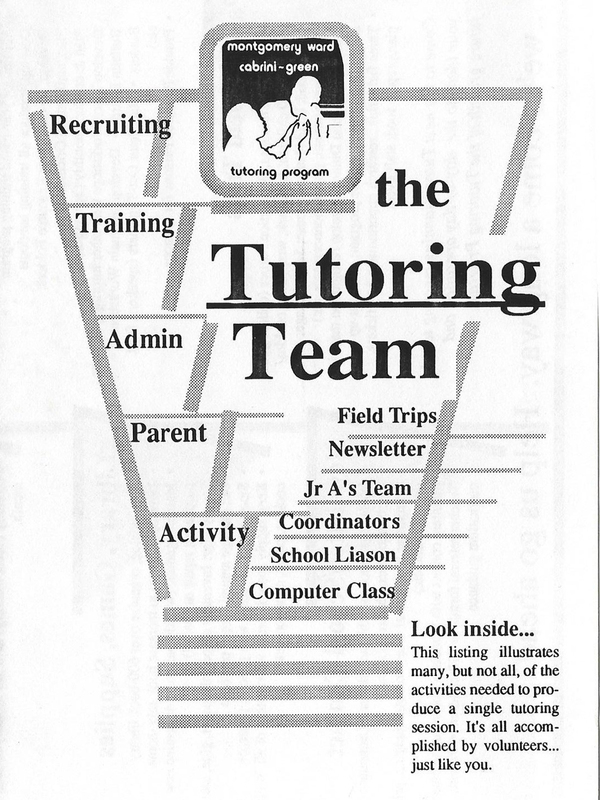 This was the front page of the Chicago SunTimes in October 1992 when myself and six other volunteers decided to create the Tutor/Mentor Connection. We did not have a template to follow. 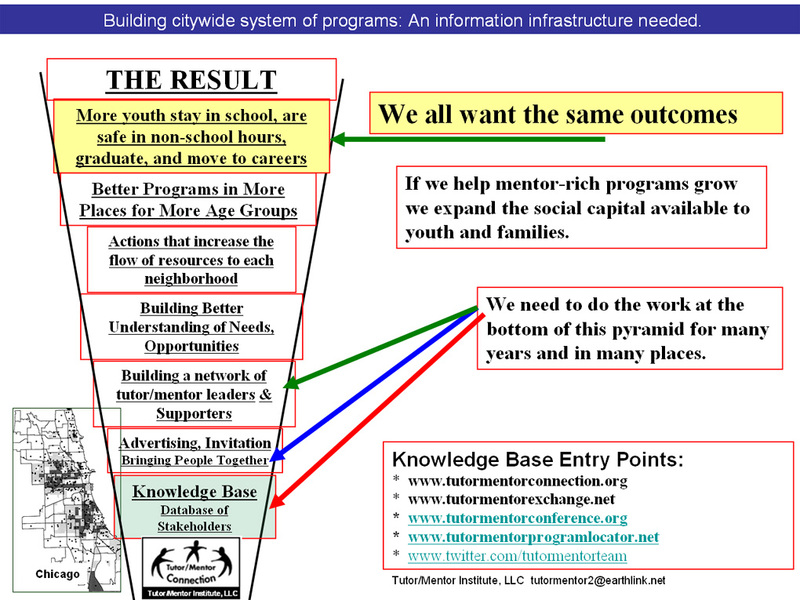 We just knew that a) there was no master database of non-school tutor/mentor programs operating in Chicago; and b) no one was leading an on-going campaign intended to draw more attention and resources to each existing programs, while also helping the programs connect and learn from each other so they all could constantly improve their impact. Over the past 24 years there have been many challenges to doing this work, and since 2011 I've not had much help. Yet the need for this still exists and I don't find anyone doing all of the things I've been doing (see 4-part strategy) to help high quality tutor/mentor programs reach k-12 youth in all high poverty areas. You can test my claim by doing a Google search for any organization focused on well-being of kids, then look at the images feature. You won't see the same mix of graphics and maps, shared over many years, like you see with my sites. While it might make sense to try to re-start the Tutor/Mentor Conference, I think it makes more sense to innovate ways to draw people together in on-line learning. I've had this goal in mind for many years, but never had the partners and resources to develop this. Thus, I'm calling on leaders to step forward and help re-energize the Tutor/Mentor Connection and carry it forward under their own power and leadership and help versions of this grow in every city in the world, not just Chicago. Read about the "do over" which I started writing about last March. Reach out to me on one of these social media platforms if you want to help. Visit this page if the help you can offer is a financial contribution to help me continue this work in 2018. 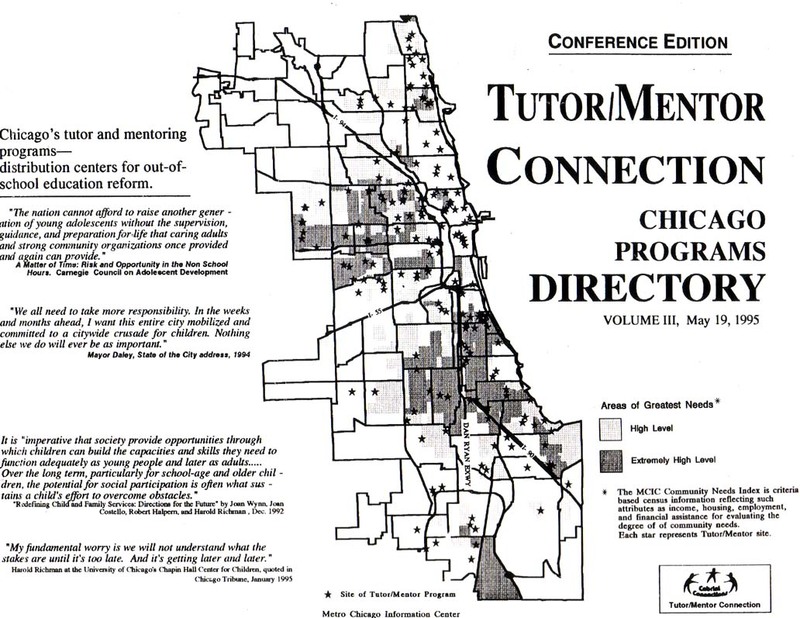 I started hosting Tutor/Mentor Leadership and Networking Conferences in Chicago in May, 1994, as part of a strategy intended to draw area volunteer-based tutoring, mentoring and learning programs and supporters together to learn from each other and as part of a strategy to increase public awareness of tutor/mentor programs all over the Chicago region, so that more would have the talent and dollars needed to sustain their work and constantly improve. 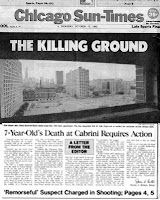 I started connecting with other people beyond Chicago via letters, telephone, and the traditional media during the 1980s and by email and on-line list serves in the 1990s. 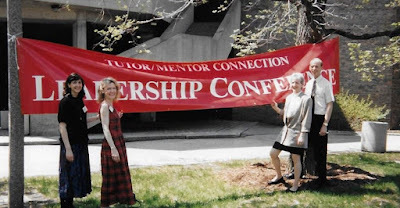 I launched the first Tutor/Mentor Connection web site and library in 1998 and have grown my connections and commitments to on-line learning, network-building, mapping and collaboration, every year since then...even though many of the people who have the money to fund my work are not yet using the Internet the same way. 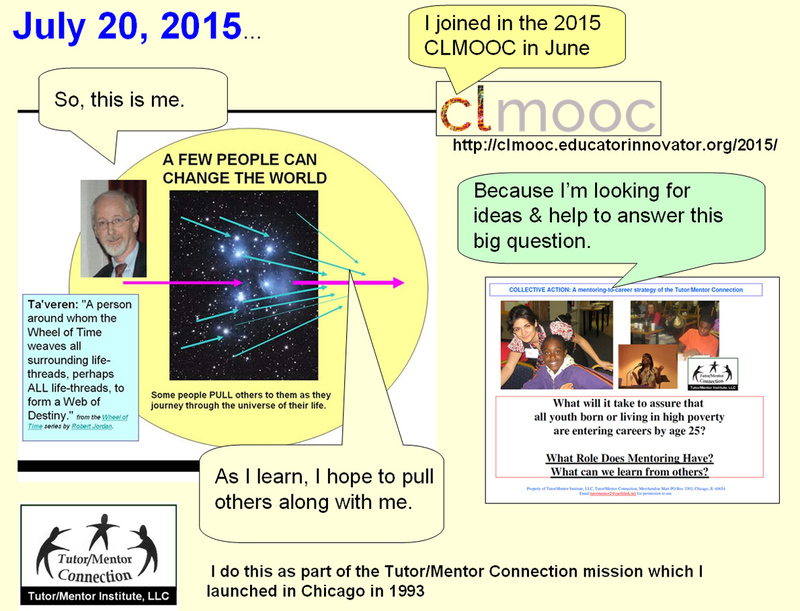 I've been participating in cMOOCs that connect people and ideas in on-line, open and on-going efforts since the late 2000s. 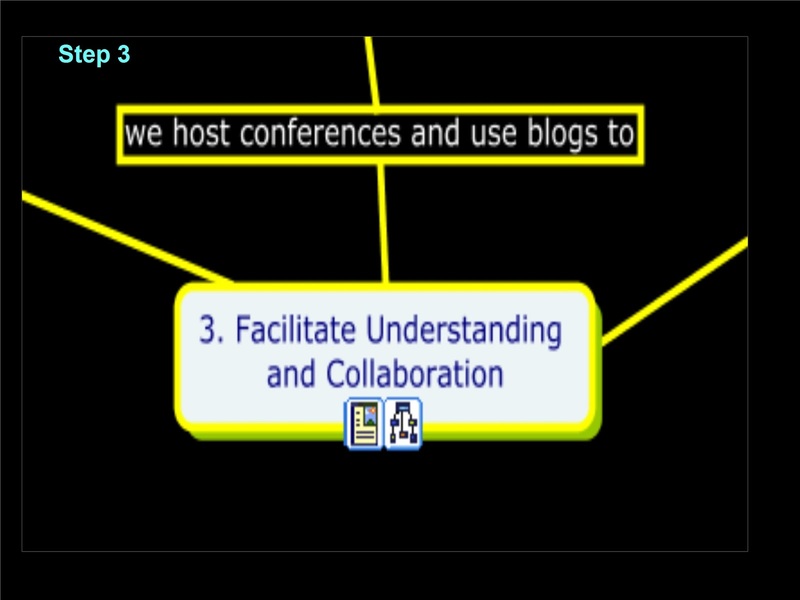 I joined a "connected learning MOOC" (#clmooc) in 2013 which encourages participants to learn new ideas and share what they are learning on blogs, and different social media platforms. 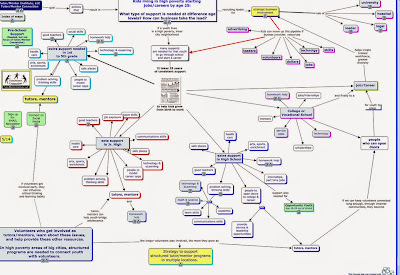 Last year, as a result of participating in this type of learning for several years, I posted a conference history story map on the Tutor/Mentor Exchange site after seeing a similar map done by someone else. Click here to see my version. I shared this link with #clmooc friends via Twitter and Terry Elliott, who I've written about before (see story), put my presentation on YouTube and added music to it. You can see it below. 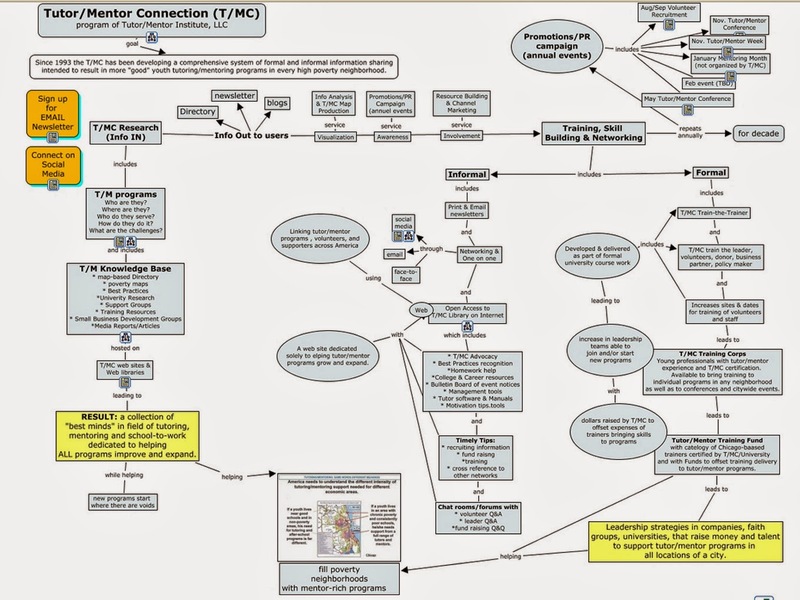 Every time I or someone else posts an article related to the mission of the Tutor/Mentor Connection and Tutor/Mentor Institute, LLC, my hope is that others will do what Terry did, and what student interns have done often between 2006 and 2015, and create their own versions and interpretations, which they share with their own network. 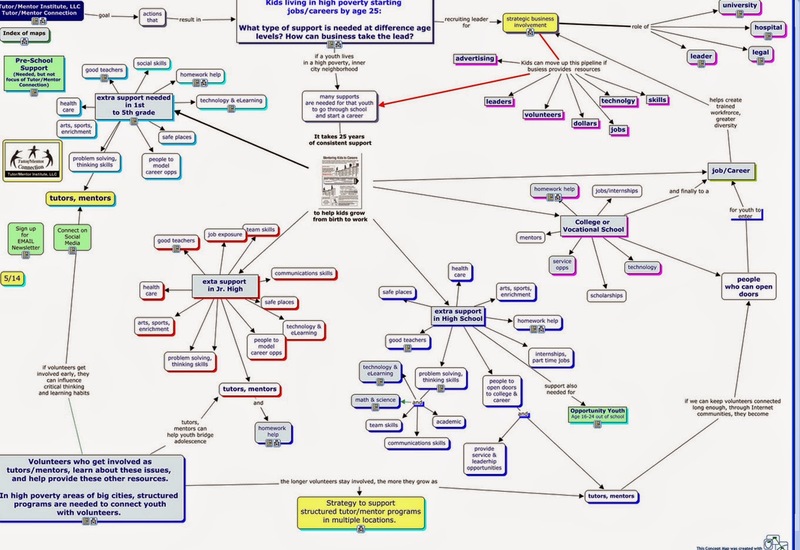 I've put together a concept map that aggregates links to blogs of Terry and others who are helping amplify and shape the ideas I've been sharing. I'd like to be adding others. Just send me a link to any stories you create. While I've not had the funds to host a Tutor/Mentor Conference since 2015, I'm still connecting people and ideas to help youth tutor, mentor and learning programs grow in all high poverty areas of Chicago and other cities. 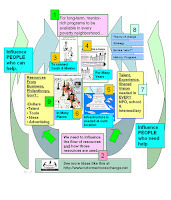 This graphic illustrates what the Tutor/Mentor Conferences were trying to do. The goal was to bring together people from different sectors who would talk about ways to build and sustain mentor-rich non-school programs in more of the places they are most needed, using GIS maps as sources of information. In reality a formal conference is not the best place to do this. You only talk to a few of the people who attended, or attend a few of the workshops offered. After the event there is little interaction between those who attended, and those who did not attend. People who can't afford fees and/or travel expenses don't attend. We need a better way to do this, and I've believed for more than a decade that on-line interaction is that better way. I've been writing about network building, network mapping, collaboration and learning since I started this blog in 2005. I hope you'll read some of the articles posted in past years and share them with people you know. The video below shows how one of my interns from South Korea shared work done by previous interns. That's what I have in mind. As you enjoy your holiday weekend, I hope you'll take some time to read this and view the video. Everyone has the power to help change the world. It starts with how you learn, and how you share what you are learning. In November 1999 I received a call from the Montell TV Show inviting me to New York City for the taping of their New Year's Eve program. They wanted to recognize me for work I'd been doing to help youth and volunteers connect in organized, volunteer-based tutor/mentor programs. They told me I could bring my wife and kids and they paid the expenses. We were picked up in a limo and stayed in a nice hotel. Then we spent the entire day at the place where they taped the show, waiting to be called on. I was the very last. By that time I'd learned that they were recognizing people who had won, or earned, a million dollars during the year, so I had some anticipation building. When I was brought to the stage, they took me to the stands and said "sit here, and when Montell calls your name, stand up." So, the commercial ended and the show started again, and Montell said the were recognizing people doing good in the world. He walked toward me, and said "Daniel Bassill, please stand." As he was headed toward me I saw a man and women walking behind him, carrying what looked like a big check. Montell asked what I do and I had about 20 seconds to respond, when he said, these folks have something for you. 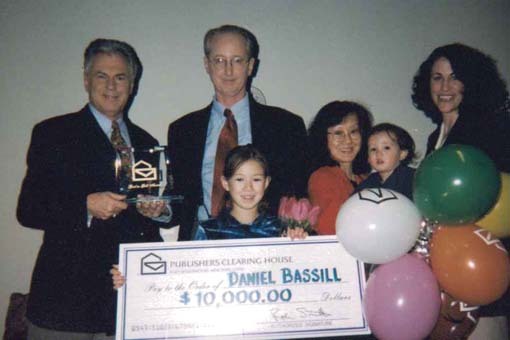 What they had was the 1999 Publishers Clearing House Good as Gold Award, and a $10,000 check. Not $1 million, but really nice. I learned later that I had been nominated for this award by the Giraffe Foundation who had named me a Giraffe Hero in 1997. The check was made payable to me and I asked them to change it, and make it payable to Cabrini Connections, since it was through that organization that I was doing the work I was doing, and they really needed the money. This was prior to the 2000-2001 dot.com sector meltdown and 9/11 which led to a three year drop in stock market values. That was followed by the war in Iraq, and the financial sector meltdown that began in 2007 and 2008, which led to another stock market meltdown. I was hurt bad in both of these downturns, and did not realize in 1999 how much I'd need $10,000 in 2017. Thus, as we head into the holidays, I hope some of you will support my work as a birthday gift (click here) and others will support it as an investment in the Tutor/Mentor Institute, LLC (click here). In both cases you help me continue to do the work described in the blog articles I've written over the past year, and the 11 years before that...and the 30 years before that! Thank you to all who have helped or let me be part of their lives. As I head into the Thanksgiving weekend I am thankful to all who have allowed me to be part of their lives, via the tutor/mentor programs I've led, and the work of the Tutor/Mentor Connection and Tutor/Mentor Institute, LLC. And I'm thankful to those like the Giraffe Foundation who recognize my role and ask others to give me their support. What if you'd spent the majority of your adult years working on something then suddenly it was no longer there? I was reading some introductions on Mastodon last week and as I thought about how I'd introduce myself, I felt a void. I started volunteering in a tutor/mentor program in 1973 the first year I was in Chicago, while starting a retail advertising career. After one year I was recruited to be on the committee of volunteers who led the program, and at the end of that year I was pulled into the role of program leader. I continued being directly involved with youth in a non-school tutor/mentor program until mid 2011 when that was suddenly taken away from me. That's over 35 years. Probably longer than most people in the country! I had no teaching or tutoring experience in 1973 when I first joined the program at Montgomery Ward's corporate headquarters in Chicago and was assigned to work with a 4th grade boy named Leo, so I drew upon my history degree at Illinois Wesleyan and my three years in US Army Intelligence, and began looking for ideas of what to do each week when Leo and I met. Then, when I joined the program leadership committee in 1974, I began to ask, "How do others do this?" and started to reach out to find other programs in Chicago who I could learn from. 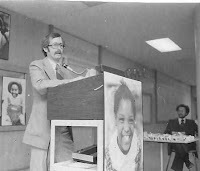 When I became program's volunteer leader in 1975 the program already had been recruiting 100 pairs of kids and volunteers to start the school year for the previous two years. However, nearly half dropped out during the year due to lack of organization and structure, and were not replaced by on-going recruiting. Thus, I accelerated my learning process, seeking out program leaders and inviting them to a monthly lunch & learn session at Wards. While I continued as Leo's tutor and mentor for another two years, more and more of my time focused on mentoring 100 pairs of kids and volunteers, as well as nurturing a small group of other volunteer leaders to help me. Leo stayed involved as a student assistant after he finished 6th grade, and I stayed involved with his life through high school, college and we're still connected today, in 2017. 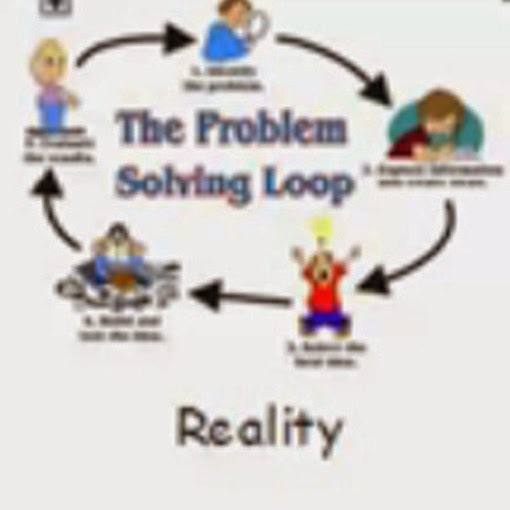 However, my life begin to take on a cycle, similar to this problem solving loop. This repeated every year for 35 years. In August, the focus was on recruiting volunteers and students from the previous year to return for another year. As we entered September, the focus expanded to recruiting new volunteers to replace those who dropped out, and to recruiting enough kids to match the number of volunteers we recruited. During September the focus was on student and volunteer orientations (training was on-going) and on matching pairs so that by the last week of September most of our kids and volunteers were paired up and getting to know each other. This matching process actually extended almost to November since we started the year with either more kids than volunteers, or more volunteers than kids, and spent the first few weeks trying to balance this out. By the end of October we'd matched all the volunteers we had on our waiting list, and then put any other kids still looking for tutors on a student waiting list. 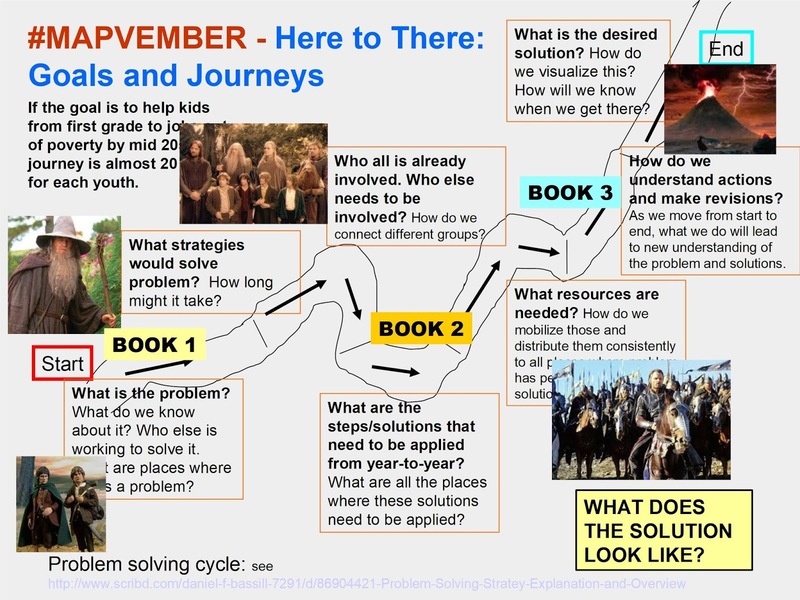 While this matching was taking place, I had to provide a weekly framework for student and volunteer activities, provide one-on-one coaching to respond to questions, find substitutes for volunteers who did not show up, and assign kids to new volunteers when their volunteer stopped coming. To aid this process we took attendance weekly, with me sitting at a table at the entry to the Montgomery Ward cafeteria where tutoring took place, and checking off names of kids and volunteers as they came in. Usually another volunteer helped me. Once the session was over I reviewed the attendance and determined which kids and/or volunteers would need follow up during the coming week. By 1979 or 1980 I was using computers and Excel spreadsheets to enter weekly attendance data into a tracking system that enabled me to see attendance patterns, enabling a focused follow up on those who had missed two or three weeks in a row. 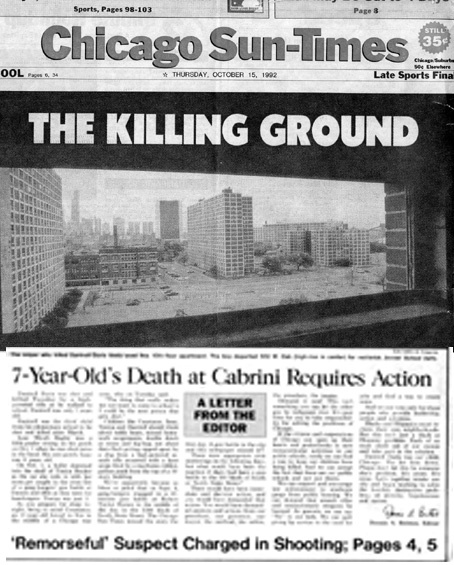 During the mid 70s the Chicago Housing Authority was the intermediary who had contact with families. While we called volunteers directly, we had to call the CHA rep, and they contacted the families, if we needed to follow up on attendance or any other issues. By the late 70's we were contacting the families directly. We provided a framework for weekly youth and volunteer activities and communicated this via verbal announcements and one page newsletters created on a duplicating machine. I had to write these and get copies made every week. As we started the year we pointed to Halloween, Thanksgiving, Christmas and then spring events as learning and writing activities. These provide conversation topics and work activities for volunteers to build relationships with kids and provided something to "look forward to". As incentives for student attendance we began to offer quarterly field trips for perfect attendance. These photos are from trips to the Indiana Dunes. Planning these trips was another on-going role. By 1980 the enrollment was up to 125 pairs and we convinced Wards to give money for us to hire a part time college student to work a few hours a week to help us. Throughout the 80's this number grew to three students, with non working more than 20 hours a week. However, they took a huge load off the weekly work I was doing. A big change was made in 1980 or 81 I changed from having a small committee of leaders that I recruited each spring to building an larger group of leaders, focused on all of the functional areas involved with operating the program. The program grew, and grew, and by 1990 we were up to 300 pairs of kids and volunteers....and we still had only 3 part time college students working 15-20 hours a week helping do the administrative work. As we moved through the year, from September to June the challenges changed from recruiting and retaining, training and on-going support, to celebrating work done during the year and recruiting new leaders to help repeat the cycle again in the following year. I did this over, and over, for 35 consecutive years! My job responsibilities with Montgomery Ward grew throughout this time. 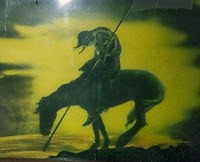 By 1980 I was in charge of the creative print development for all of their national advertising and throughout the decade I took on other management and planning responsibilities. Yet, I also devoted huge amounts of time on weekends, evenings and lunch breaks to the work of leading the tutoring program. 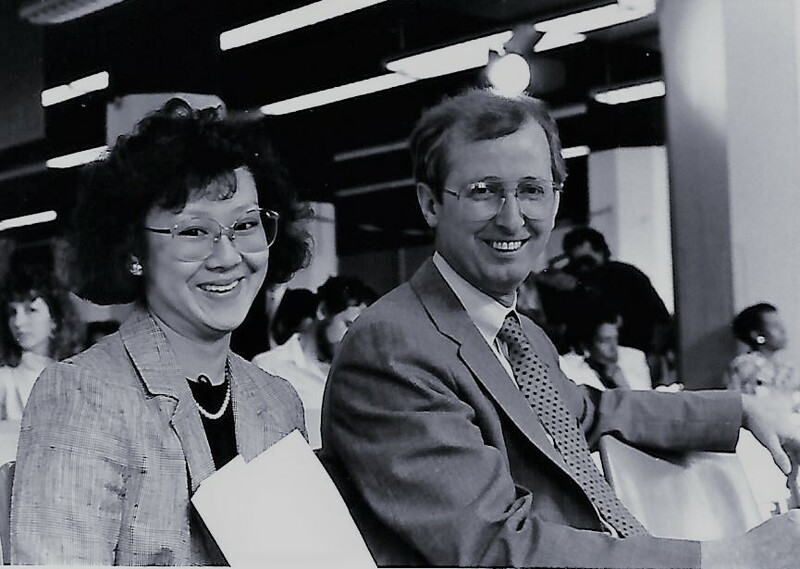 I met my future wife Emily in the early 1980s when she became a volunteer tutor and much of our social life was centered around tutoring program activities and volunteers. We were married in 1986 and while she took evening college classes I spent time in my office either doing my advertising work, or my tutoring program work. Things changed in 1990 when I was given the opportunity to leave Wards (or be fired) and I turned that into an opportunity to convert the tutoring program to a non profit where I could provide full time leadership and get paid at the same time. 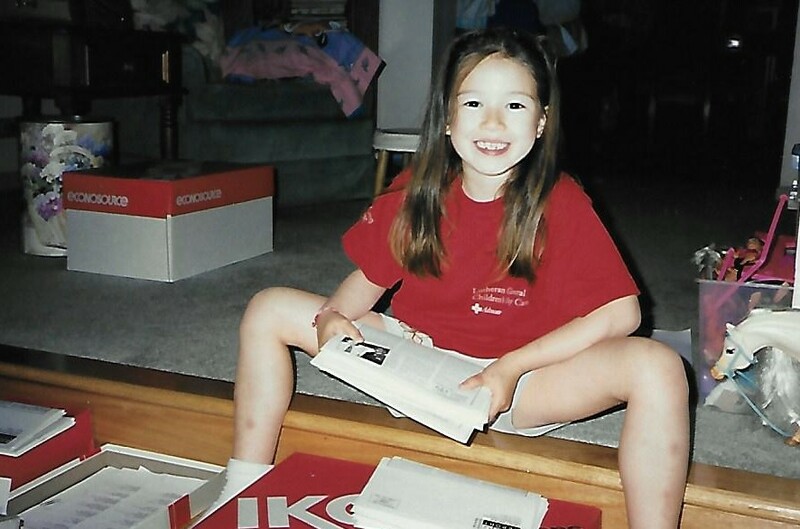 Things really changed when our daughter Amanda was born in October 1990, about the same time as we received our 501-c-3 papers. With the birth of our daughter Emily was no longer involved with the tutoring program, but with the day-to-day work of raising a child, and holding her own job. 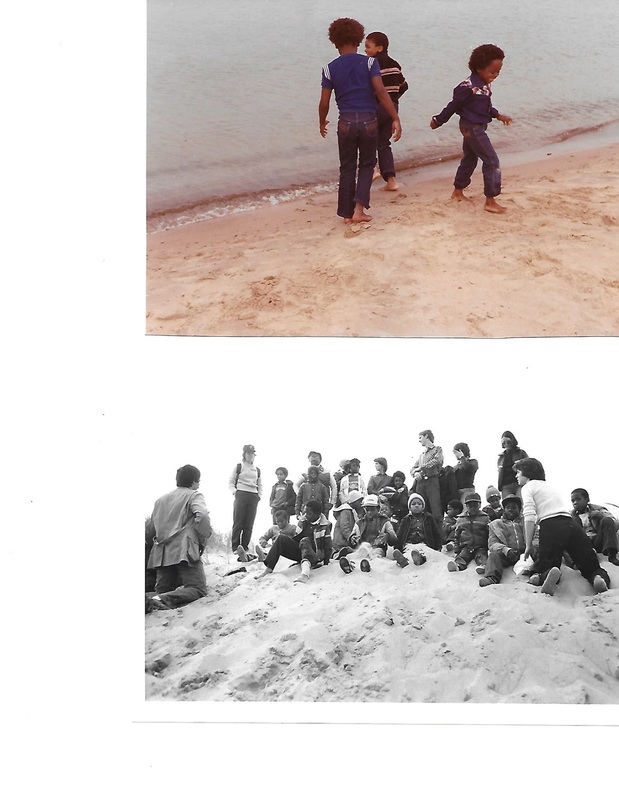 Our time to socialize together with the volunteers in the program was greatly reduced in the 1990s, and 2000s. The new non profit, which we named Cabrini-Green Tutoring Program, Inc., was an artistic and financial success. We grew to 440 students and 550 volunteers by June 1992 and raised over $100,000 to fund our operations. However, I misjudged what it would be like to have a governing board overseeing my work, and the frictions that grew over those two years led the board to fire me without notice in October 1992. Of course they did not consult with the volunteers, students or parents when they made that decision. As a result many volunteers rallied to my defense and wanted to fight my firing. However, as this was happening, something else happened that changed everything. A 7-year-old boy named Dantrell Davis was shot and killed in Cabrini-Green. He was related to many of the kids in the tutoring program. I was driving home as I listened to this news on the radio, and the thought popped into my mind "I don't need to lead an under funded program with 900 people involved, and with a dysfunctional board, to share what I've learned over the past 17 years to help tutoring programs grow in all poverty areas of Chicago." I immediately stopped looking backwards to regain what was lost and began looking forward. At the same time, I recognized an opportunity to fill two voids. Parents had been asking for a program for kids beyond 6th grade, and I'd begun to develop an expanded Junior Assistant program in 1990 and 1991. With the help of six other volunteers created a new volunteer-based tutor/mentor program aimed at helping kids move from 7th grade through high school and beyond and named that Cabrini Connections. That filled the first void. 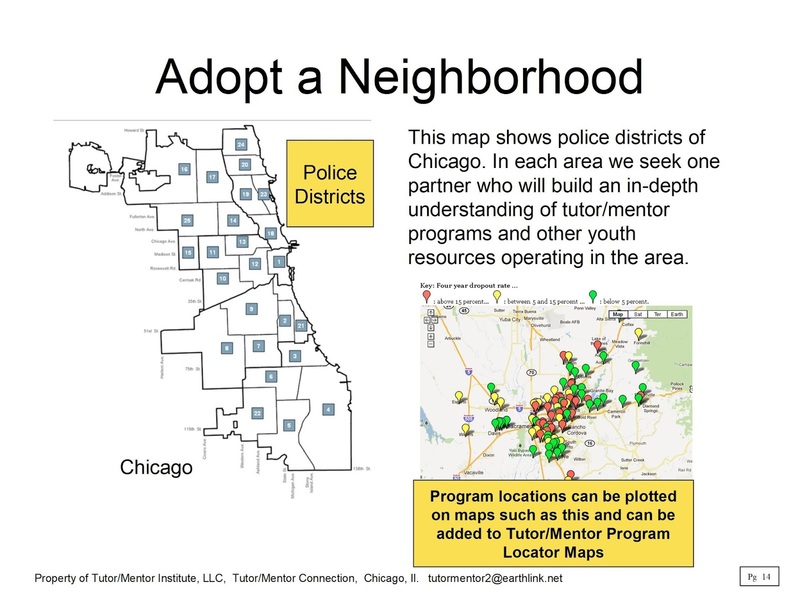 To fill the second, and larger void, we created the Tutor/Mentor Connection to help similar programs grow in all high poverty neighborhoods of Chicago, including our own Cabrini Connections program and the Cabrini-Green Tutoring Program, Inc. 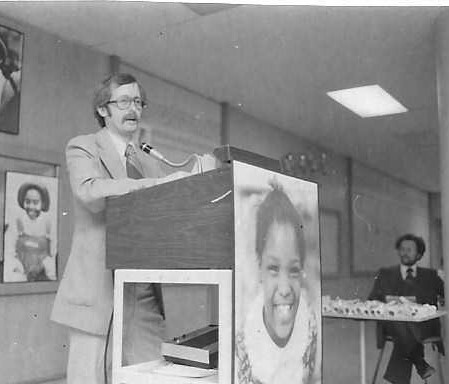 The Cabrini Connections program launched in January 1993 with seven volunteers and five teens meeting in the day-room at St. Joseph's Church. 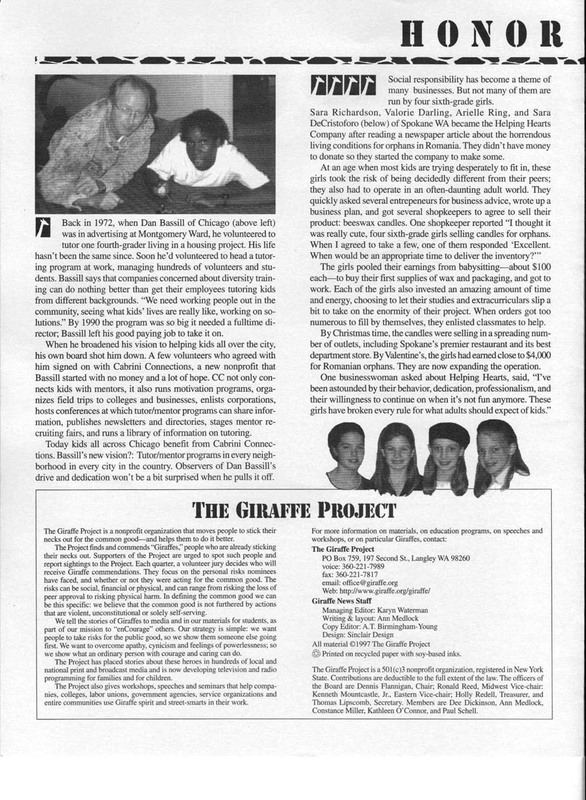 In the fall of 1993 Wards donated space on the 16th floor of the corporate tower on Chicago Avenue, and $40,000 a year, and we move our operations there and started to add new 7th and 8th graders each year. By 1997 we were serving about 80 pairs of kids and volunteers and by 1999 the first 7th graders were finishing high school. By 2003 some of these were finishing college. 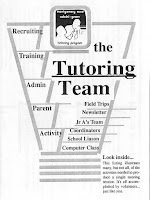 We spent 1993 planning the Tutor/Mentor Connection and launched our first program survey in January 1994. 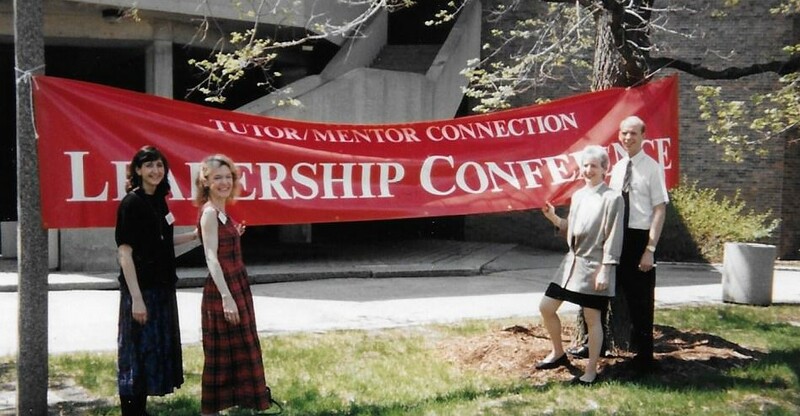 120 programs responded and we printed the first Tutor/Mentor Programs Directory and held the first Tutor/Mentor Leadership and Networking Conference in May 1994. Over the next few years we created an information based strategy and quarterly events to draw attention to tutor/mentor programs throughout the city of Chicago. With the first 1993 grant of $40k from Montgomery Ward we hired two veteran tutoring program volunteers (Gena Schoen and Claudia Crilly Bellucci) to work part time as leaders of the Cabrini Connections program. Working together we created a structure for the tutor/mentor program and from that point forward my role as President was to overview that work, provide ideas, fill in during transitions of staff, and raise money to pay the bills. 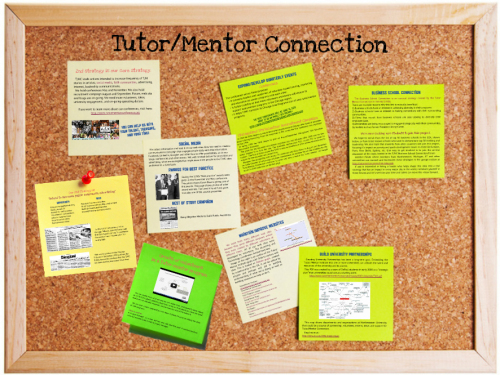 I also provide much of the work behind the work of building the Tutor/Mentor Connection. We never had enough money, or enough staff do do all this work, which meant that I spent countless hours, weekends included, doing program work. I often brought our quarterly newsletters home and Amanda would help me put mail labels on them. Our son Jacob was born in 1998. The responsibilities of being a parent grew, but the responsibilities of leading a small non profit with more than 200 people depending on me to keep the doors open, also grew. My daughter once said to me "Daddy, you love those kids more than you love us." That hurt. Yet over the years I've talked about the work I was doing as part of a "War on Poverty." I realized that I could do little to change the education system, or change the habits and behaviors of parents living in high poverty areas. But through the tutoring program I felt we could help kids escape the cycle of poverty by helping them through school and into college and careers. I realized that one small program could be life changing for a few kids, but would have little impact on the couple hundred thousand kids living in poverty in Chicago. That's why I have been so passionate about the Tutor/Mentor Connection and its goals. Youth in poverty, and their parents, need a system of supports. This map visualizes some of the supports that are needed. 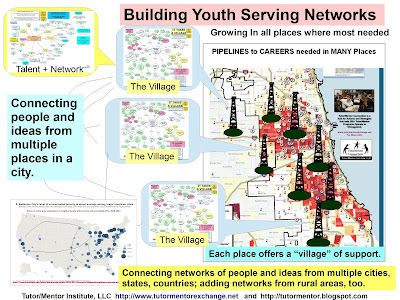 However, there were few leaders in Chicago, or the country, using maps and visualizations and thinking of ways to support an entire ecosystem of youth serving organizations, using the same strategies that teams in corporate headquarters of big companies like Wards were using to support multiple stories all over the country. 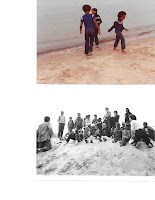 Thus, just getting the attention and participation of youth, volunteers and donors in a single program, and support for the intermediary role of the Tutor/Mentor Connection often seemed like a Marine battalion's efforts to land on a fortified beach. You took a lot of casualties before you were able to get a foothold, then move inland. In many ways I think I'm still fighting that battle. I recognized that I was neglecting my own kids to help other kids who lived in high poverty neighborhoods and did not have the support my kids enjoyed where we lived. I rationalized, that in war, soldiers leave home for years on end, and some never come home, or when they do come home they are severely injured. We accept that as a price of freedom. I said to myself, "If I can help make a world that is better for kids born in poverty, then I'd be creating a better world for my own kids and grandkids, too." 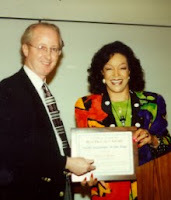 I met Merri Dee of WGN TV in the early 1990s and she supported my work through the early 2000s. She gave me a slogan that I took to heart. If it is to be, it is up to me (and you). In 2011 the board of Directors at Cabrini Connections asked me to resign, as a result of the financial crisis that had started in 2008. They gave me ownership of the Tutor/Mentor Connection as part of the deal, since they did not want to continue supporting that strategy. I created Tutor/Mentor Institute, LLC since I did not have a group of volunteers to help me create a new non profit structure. I've continued to lead the T/MC since then, but without any source of revenue other than my own savings and social security. In many ways I've had more time since 2011 than ever before to focus on the work of the Tutor/Mentor Connection, because I've not had responsibility for the weekly operations of the entire organization and the kids' program. Yet, when I was thinking of how I'd introduce myself in that group last week, I recognized that I have had a huge void in my life for the past six years. 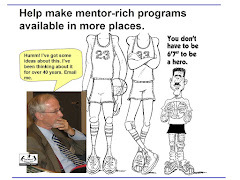 I spent almost every day for 35 years thinking of what needed to be done to connect youth and volunteers in a single tutor/mentor program. I got to know the kids who came to the center as they kept coming back from 7th grade through 12th grade. I got to know the volunteers, too, and some of them had a huge impact on helping get the Tutor/Mentor Connection started. That involvement with the youth program was a big part of my identity. It gave me daily reinforcement for why the Tutor/Mentor Connection was so needed. I've not had that anchor in my life and that make the introduction difficult. At the same time, my own kids are now adults, and the world I hoped to build for them is still just a dream. Want to help? Connect with me on any of these social media platforms - click here. This week I decided to spend some time listening to presentations of the 2017 Global Education Conference. It's still going on, so here's the agenda for next two days. All sessions will be archived, so don't worry if you miss anything. As I listened to sessions I shared some of what I was learning on Twitter, using #GlobalEd hashtag. 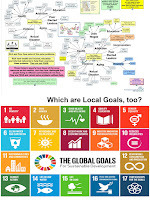 Then this morning I tuned into a discussion of #GlobalGoals and #MakeourWorld, which both talked about some of the same things that were being discussed in the Global Ed Conference, such as how do educators engage youth in solving global problems defined by the United Nations, by 2030. 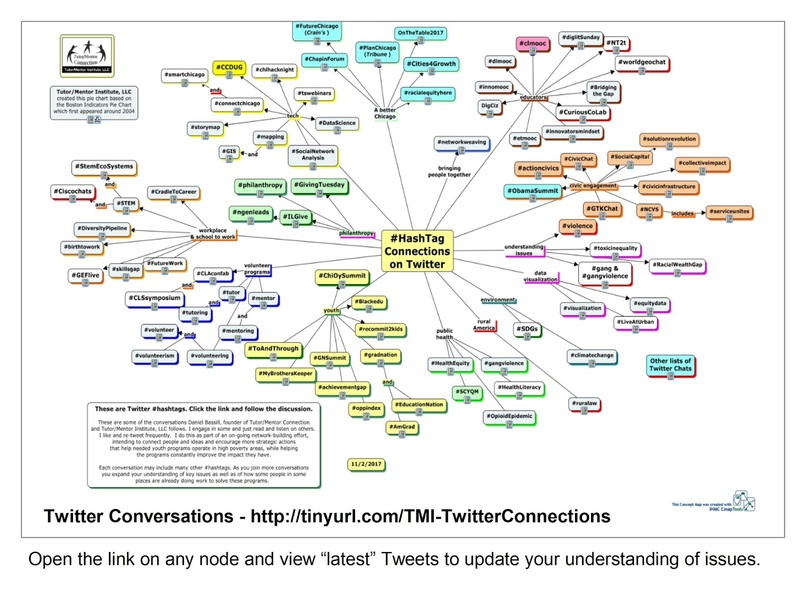 I added links to all three chats in my hashtag map so I could go back later and look more deeply into ideas and links that were shared, and add relevant ones to my own web library. MERLOT, is a Multimedia Educational Resource for Learning and On-Line Teaching. The site hosts thousands of on-line learning objects that focus on Information & Communications Technology (ICT) Literacy. Click on the link above and on the first page you'll find a list of collections that educators and leaders of youth tutor/mentor programs should find interesting. For instance this link points to Fake News teaching resources. Then through today's #GlobalGoals chat I learned about The Global Opportunity Explorer Platform which is collecting hundreds of sustainable solutions and market opportunities which address the SDGs (Sustainable Development Goals). 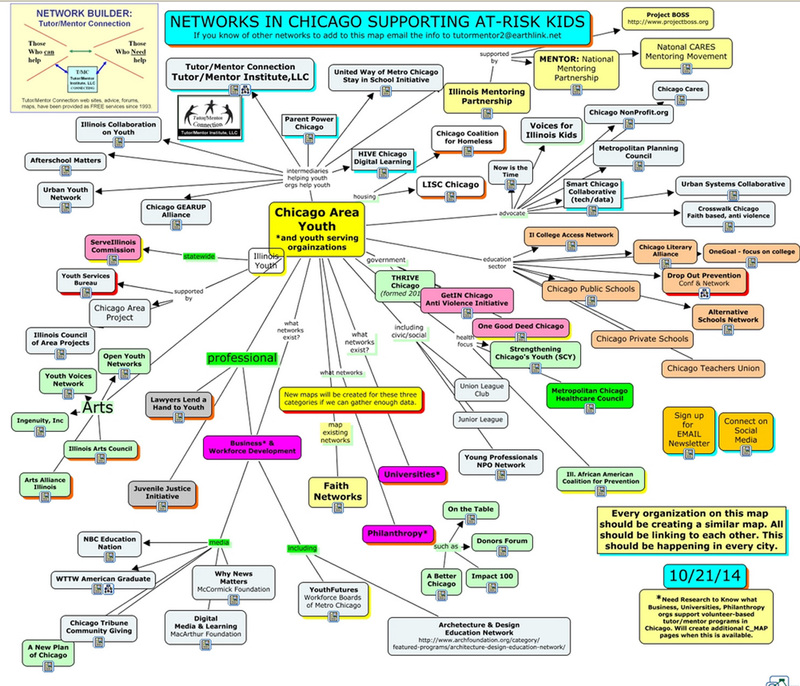 I created this cMap to show other organizations in Chicago who were working to help youth succeed in school and life. On each node is a link to the organization's web site, where ideally you'd find links to information related to the work that organization, and members of its network, are doing. At the bottom of my map you can see four categories, highlighted in dark pink, which focus on business, philanthropy, faith groups and universities. I'd love to find a site like The Global Opportunity Explorer, aggregating stories about what business or philanthropy is doing to help non-school tutor, mentor and learning programs grow in high poverty areas of Chicago, or any other city. The library I've been building since 1993 has tried to collect links to organizations doing good work, as well as resource providers doing good work in helping them. I don't have nearly enough information in some categories, so I point out the Merlot and Global Opportunity Explorer platform as two examples of organizations that are aggregating information to support others who are trying to create a better world. The challenge is, that there is too much information, or too little time for people to dig through all the sites to find what they are looking for. I have long recognized this problem. 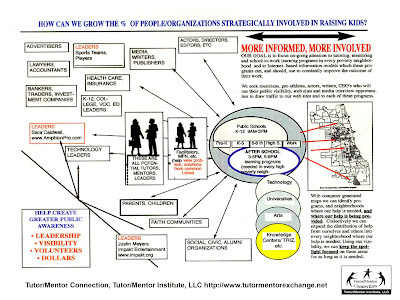 In the four-part strategy I launched in 1993, Step 3 focused on facilitating understanding so more people find and use the information that I'm collecting. That's why the Global Ed Conference session I watched yesterday, led by Barbara Bray appealed to me. In preparation for her session Barbara created a Google doc, with a list of links she was talking about. Instead of saying "wade through 2000 links, she pulled out about 20, then talked about them in her recorded presentation. This is what interns were doing for me between 2006 and 2015 during projects that lasted from a week to a year. 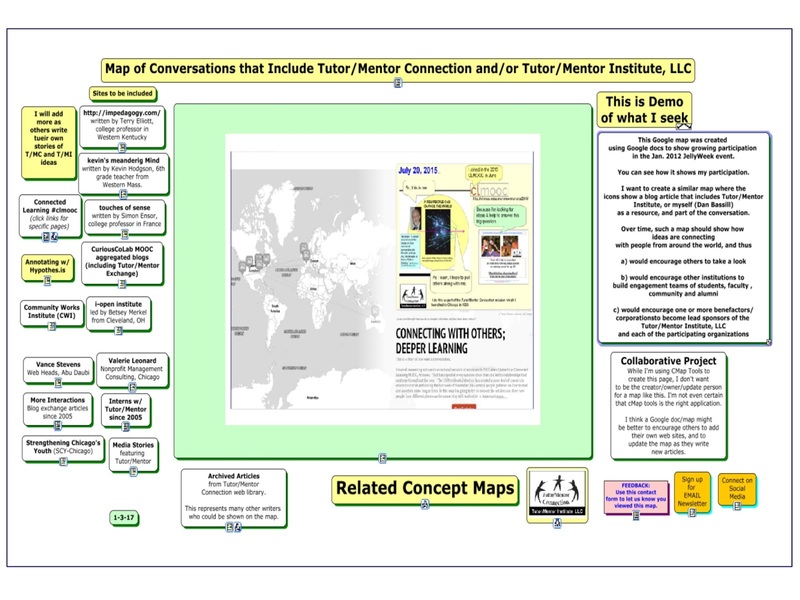 Visit this page and find visualizations done to show information and ideas of the Tutor/Mentor Connection which were communicated in a variety of formats by many different students. With so much information and so many problems to solve, this is a role that schools and volunteer-service organizations from thousands of places could be taking on an on-going basis to get more and more people engaged in solving problems, capitalizing on opportunities, and creating a better future. In one of the final posts to the #makeourworld chat today, +socialgood posted a message asking "what is something you need help with". My response is shown below. It's the work at the bottom of this pyramid that supports what all others need to be doing. Click here if you want to provide financial support or reach out via social media if you want to help in other ways. These are a couple of guys I served with when I was in the US Army and stationed in South Korea during 1970-71. Prior to that I spent a year in Washington, DC in an Army language school, then 9 months in Baltimore at an Army Military Intelligence training school. Before that I did my basic training, starting in Nov. 1968, at Ft. Polk, Louisiana. I met some great guys, from many different backgrounds, at each of these postings. I kept contact with some for many years after leaving the Army, but in the past few years I've not had contact with any of them. This was home while I was in South Korea. It had no insulation so during the winter I used the holiday cards people sent me to cover seams in the walls to keep the cold out. While I was stationed about 30 miles from the demilitarized zone, I never was in much danger while in the service. My greatest fears came in my first couple of years as I wondered if I'd be sent to Viet Nam, where the dangers were far, far greater. I had majored in history while in college at Illinois Wesleyan, so being part of Military Intelligence was a natural progression for me. In both situations you're collecting best available information and using it to support decisions and problem solving. Maps are a vital tool in this process. I've applied that thinking for the past 40 years in my work, but as a retail advertising writer/manager with the Montgomery Ward headquarters in Chicago, and as a volunteer tutor/mentor and program leader, starting in 1973 and continuing through 2011. 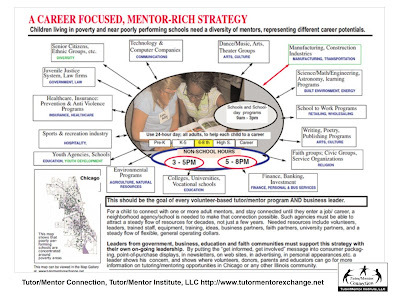 I have also applied that thinking in the work of the Tutor/Mentor Connection, which I formed in 1993, and Tutor/Mentor Institute, LLC, which I formed in 2011, with the goal of helping high quality, mentor-rich, non-school youth programs reach k-12 youth in every high poverty neighborhood of Chicago. For the past three year's I've used this graphic in blog articles (click here) that invited veterans, and active duty military, to get involved and support the work I'm doing. 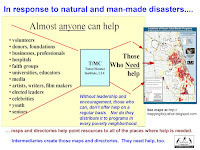 The planning skills military leaders develop could be applied in any city to support a T/MC type structure. The leadership skills officers and NCOs learn would make them excellent mentors, tutors and program leaders. The network of military men and women would provide a rich support system for those who get directly involved. As we honor veterans and their memory, let's give time to think of the men and women who served in the Armies of other nations. I took this photo in 1970, at the South Korean Military Memorial Cemetery. I hope our leaders think of these lives as they talk about taking the US into new wars around the globe. 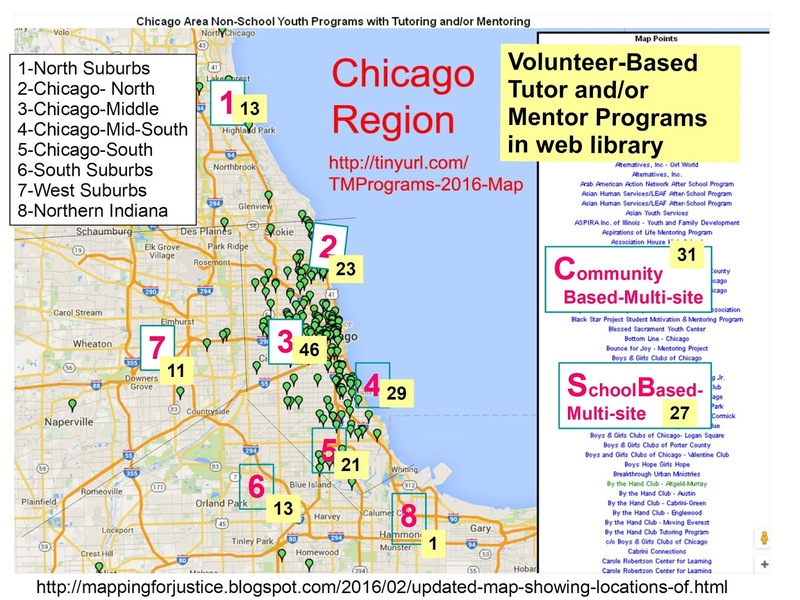 What Tutor and/or Mentor Programs Operate in Chicago Area? Since 1993 I've led a small organization with a huge vision. I think every k-12 youth living in a high poverty neighborhood should have access to a well-organized, mentor-rich, non-school tutor, mentor and learning program. When I say access I mean it needs to be close enough that elementary school kids can walk there and safe enough that youth of all ages, and volunteers from different parts of the region, will participate weekly, for a year or longer. 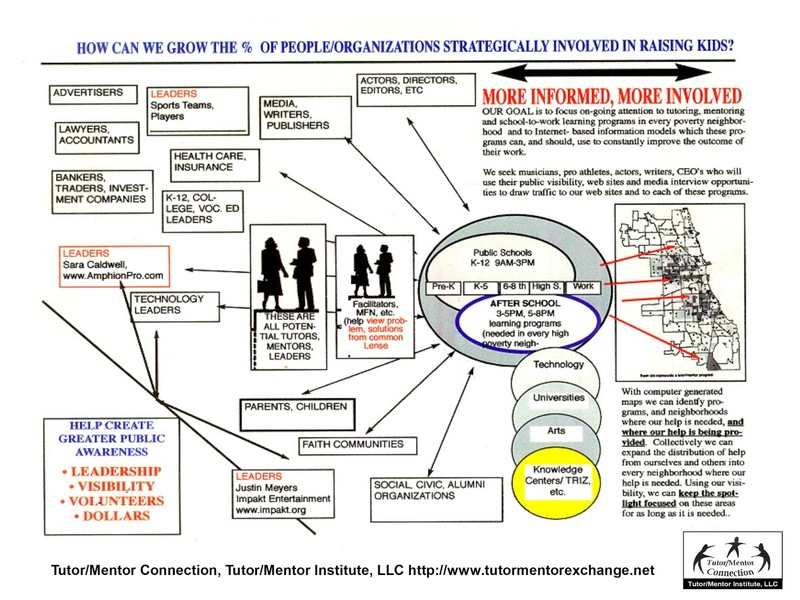 I launched the first Tutor/Mentor Program Locator survey in 1994 and 120 organizations responded. Thanks to donated software and volunteer talent, I've been plotting that information on maps for the past 24 years, so that people could see which areas have programs and which still need more programs. I never had much help to do this and since 2011 I've had no help. Thus, keeping the program list updated has been a challenge, and keeping the web sites updated and working properly has been an even greater challenge....which I'm currently losing. However, you can help. Below is a map I created in Jan 2016 to show programs in my web library. I updated it today to show the number of organizations I have in my web library, for each section of the city and suburbs. I've divided the region into sections, and for each section I've shown the number of web sites that I have in this library on the Tutor/Mentor Connection site. Thus, you can see that I have 13 web sites for Evanston and the North and Northwest suburbs. I have seven web sites for every area West of Chicago out to Elgin and Aurora. I show 13 web sites in the South and Southwest suburbs and one (1) for NW Indiana. In Chicago I show 23 web sites for the North part of the city, 46 for the middle, 29 for the South Central and 21 for the far South. Some organizations are community based or have multiple locations, so I include them in a separate category. It includes 31 organizations. Other organizations only offer services at schools, meaning youth who don't attend that school don't get those services. I show 27 organizations in that category. 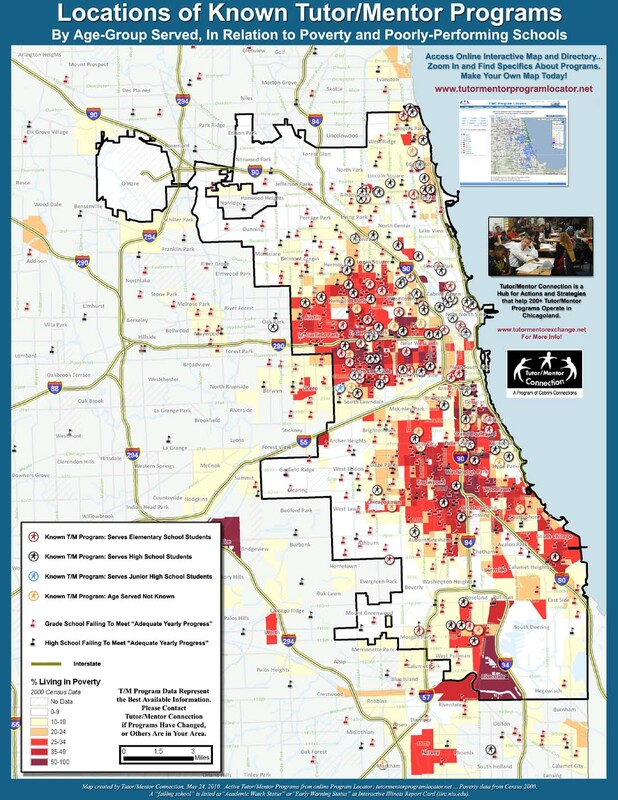 There are at least 200,000 high poverty youth in Chicago who could benefit from organized tutor, mentor and learning programs and thousands more in the suburbs and Northern Indiana (where I only find one program). There must be more. 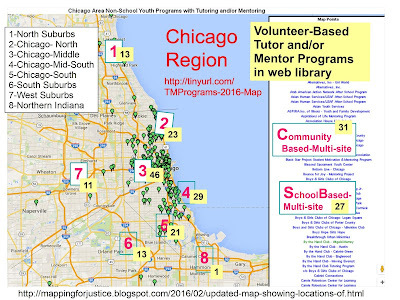 I'm sure there are other organized non-school tutor and/or mentoring programs in the Chicago region. That's what I hope you will help me with. Here's a map showing police districts in Chicago. If you click on this article you'll see schools. If you click on this article you'll see libraries. And, if you click on this article you'll see maps of faith groups. Volunteers from any of these groups could adopt a neighborhood of the city and suburbs and determine if there are any organized tutor/mentor programs in that area. If you find one, send me the link and I'll check it out and add it to my list. Volunteers can also review sections of my web library and look at the web sites. If you see one that no longer is operating, or that I've placed in the wrong area, please send me an update. Here's the survey I was using in the 1990s to collect this information. You can see the level of detail I was looking for. You don't need to fill this out, but it might help you as you look at youth program web sites. Here's another presentation that shows what I think volunteers, donors and parents should see on a program's web site. Many show some of this. Few show all of it. As you learn about programs in your area help draw regular attention to them by talking about them on social media, or in company and faith group newsletters and blogs. If we have better information on who is already operating we can do more to help each program become world class in how great it is at helping kids. We can also provide better information that groups in other places can use to start new programs where too few exist. I'm not able to do this by myself, but I don't think I'm the only person who cares about the well-being of youth in our region and the quality of life and future workforce. I think many can help me do this work. Send updated to me at tutormentor2 at earthlink dot net. Now, if you have tech skills and want to help update the tutor/mentor program locator I could really use your help. The map I created in 2016 does not sort by age group served, type of program or zip code and does not include overlays showing where programs are most needed (based on poverty or school performance). The Program Locator has those features, but I've not been able to add info since 2013 and the census data is from the 2000 census. I don't have the money to hire help, and so far have not found volunteers who would help. If you're interested or would like to partner and/or sponsor this work, and help carry it into the future, please reach out via the email above. I watched several of the presentations from last week's Obama Summit via livestream and shared ideas via the Twitter chat at #ObamaSummit. I'm still going back through the Tweets to read some of the recaps from the event. 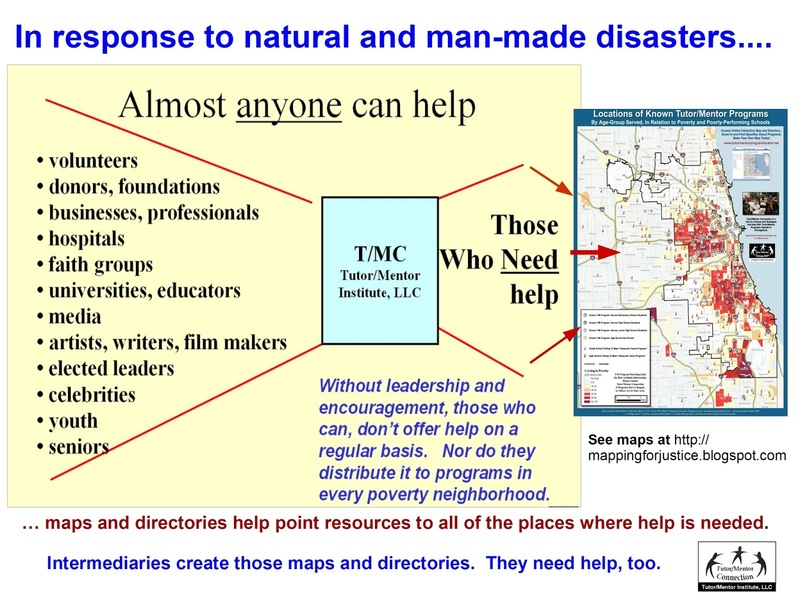 So far I've not seen any uses of maps and visualizations to show places where people need help, or to show the work that needs to be done, and the resources and talent needed, to solve the problems of Chicago or the world. 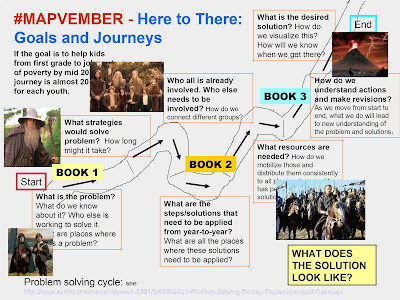 I've been following systems thinking work by Gene Bellinger for several years and this week I watched Gene present an introduction to systems thinking tools. If you visit this link you can go through that presentation yourself. 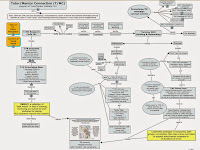 I've been using visualizations and concept maps since the 1990s to share my ideas. You can find these embedded in many articles on this blog. Thus, I've seen a lot of potential in using some of the tools Gene points to, but I've not wanted to invest the time to learn how to use them and launch my ideas onto a new platform, without the help and involvement of others who might want to use those ideas. 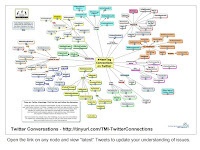 For the past few years I've been connecting with a group of innovative educators via a Connected Learning Community, that uses the #clmooc hashtag to connect on Twitter. One way this group has stayed energized is that each year, and often during the year, they encourage each other to "make" things, using resources they know about, or resources they learn about from each other. Thus, this November, they are encouraging people to make maps. You can read the introduction here. As I watched Gene's presentation I thought to myself, "What if I could start a project on Kumu.io, then invite interested folks from #clmooc to come in and help me?" So, this morning I took the plunge. Below you can see a screen shot of a project that I've launched. 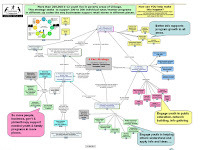 I hope that some of the #clmooc folk, and perhaps some who are inspired by the Obama Summit, will take a look at this information and begin to use these tools to map their own ideas and network. 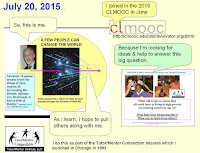 If you follow #clmooc on Twitter, or Facebook, or through their G+ community or web site you'll see many examples of how one person launches an idea and others re-mix it in many creative ways, often in collaboration with others. Systems thinking is not a new idea in parts of the education community. The Walters Foundation and the Creative Learning Exchange both focus on education applications. 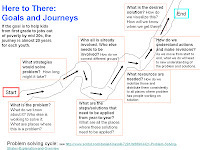 I suspect many in the social sector are also using systems thinking and concept mapping, but I've not seen many examples on web sites of youth development, tutoring and/or mentoring program web sites. I hope that my contribution today will lead to new ideas shared in the coming month and years that use systems thinking, Kumu, InsightMaker and the ideas Gene Bellinger has been sharing. Maybe some of these maps will point to others who are already using these tools effectively. I'm listening to the presentations of the Obama Summit, being held in Chicago, and Tweeting out ideas at the same time, using hashtag #ObamaSummit. If you're not able to watch today, the archives will be available. As I've listened to the aspirational nature of this event, I hope that participants will be thinking of how they map the steps that get us from "where we are now" to "where we want to be. That's what this graphic represents. 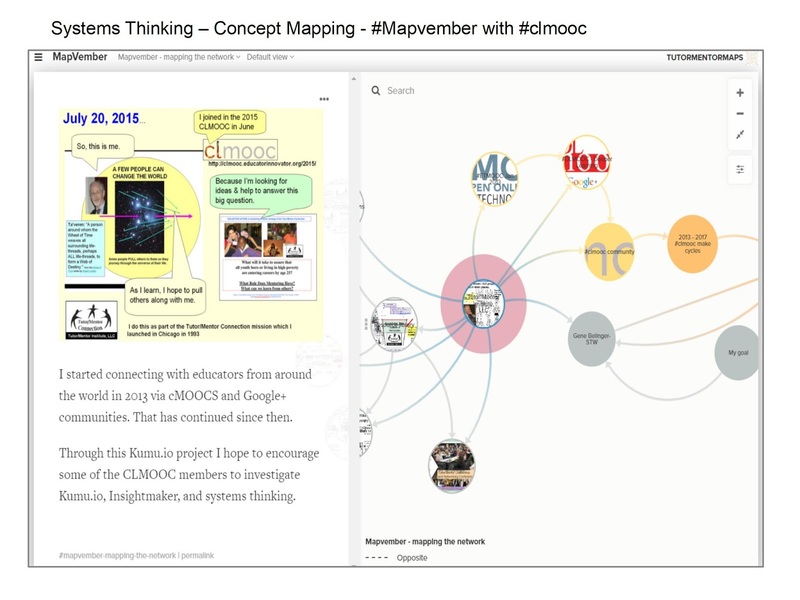 At the same time, the Connected Learning #clmooc community has launched a November activity around the idea of making maps, using hashtag #mapvember to share daily creations, or makes. Here's the page where this activity is described. I was really honored, and pleased, that my own map making was included as one of the inspirations people were encouraged to consider. Since #mapvember focuses much on fantasy maps, I created a version of the graphic above, to show the journey described in Toiken's Lord of the Rings novels. From the start there was a destination in mind, Mt. Doom and a place where the Ring could be destroyed. Along the way friends and resources had to be located, challenges overcome, and disasters averted. 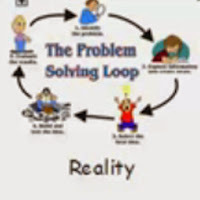 Apply this to real world problem-solving journeys. I included this graphic in an article I wrote in August 2017. My "Race-Poverty" map is shown at the top while the United Nation's 17 Sustainable Development Goals are shown at the bottom. Each node on these maps represents a complex, entrenched problem that appears in many places throughout the United States and the world. 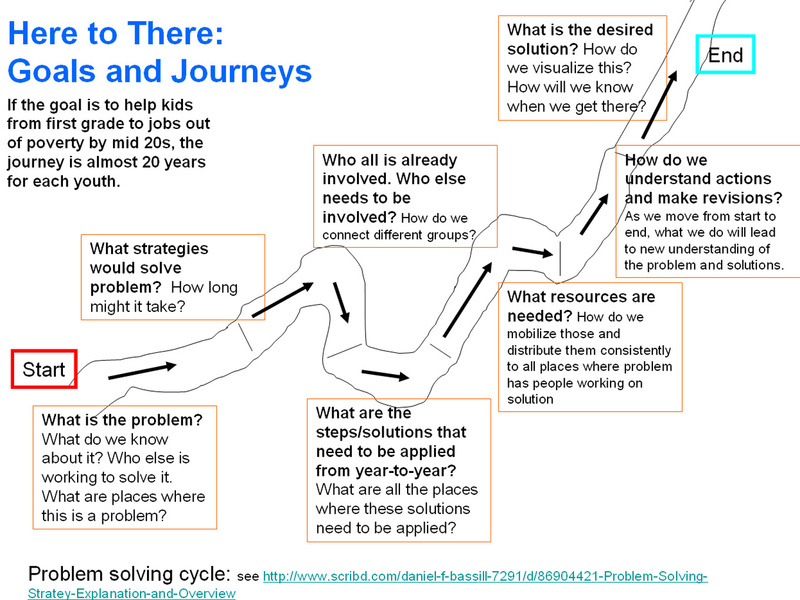 It will take many years of consistent effort, innovation, and resource flow, to make a dent in these problems. Without creating a map, building a team, and launching a journey, not much is likely to happen. My primary concern with the Obama Summit is that young people are being encouraged to go forth and create new solutions to old problems. In 1997 I was a delegate to the President's Summit for America's Future, where people were encouraged to go forth and find solutions to the poverty affecting more than 13 million children in America. In 1997 the result was many people energized to find new ways to solve problems that I and many others had been working on for many years. Instead of the event bringing reinforcements to help us do this work, it actually drew resources away from us into "new ideas" launched by others. If this cycle repeats, the new ideas generated in the next few years will be "old ideas seeking support" in a few years. What the Lord of the Rings journey represents is a commitment to one purpose that was sustained over many months, despite the obstacles. So, do your homework. Who's already working in the field you want to support. How can you help them become great, or stay great. Only start something new if nothing exists in the area you want to help, or if what does exist is under-performing and can't be fixed. I encourage you to dig deeper into my "here to there" graphic. Here's one article.